First I want to explain the political significance of Elizabeth’s decline, and then present the various accounts of her death in a series of posts. Some of the accounts are first hand, some second hand; some matter of fact, some spooky. There is no historical consensus, and scholars are selective in the weight they give to each source (an excellent summary by Leanda de Lisle in After Elizabeth). So I hope this series will be useful. In the end I want to explain why this event is so controversial, and why so interesting – at least to myself. Elizabeth’s death was a great political moment for England, but also for Scotland and for the concept of the British Empire. It produced a royal succession that shifted the alliances of western Europe, tilting the balance of war and religious conflict, which in turn influenced European colonisation of the New World and Asia. In sum, the world looked on as Elizabeth reached her end. At the time of Elizabeth’s death England was in a poor state – still at war with Spain and in the final throes of a long and brutal military campaign in Ireland. During that campaign the queen’s favourite, the Earl of Essex, had quit his post as commander-in-chief and returned to England, where he eventually engaged in a revolt against the crown in February 1601. The revolt failed and Essex was put to death. By the end of 1601 Elizabeth had been compelled to address parliament on the issue of price inflation caused by her granting of oppressive trade monopolies. Her subjects were suffering, and in the summer of 1602 she grieved over, “the poverty of the state, the continuance of charge, the discontentment of all sorts of people” (de Lisle p.38). There were also loud complaints from abroad about piracy by English adventurers, whose thieving ways were funded for private gain by members of the queen’s own privy council. Plus ca change. At the same time the struggle for the succession to the throne was playing out. Catholic enemies on the continent had their own candidates, but within England the strongest claim lay with Arbella Stuart. 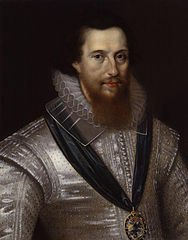 This inside challenge was contained by Robert Cecil, Elizabeth’s chief secretary, who busied himself in promoting the claim of the King of Scots, James VI. For Elizabeth it was a succession of woes, and at this point she admitted to the French ambassador that she was weary of life. By Christmas of 1602 her godson, Sir John Harington, was convinced she was dying. But the deterioration of her health and spirits seems to date from the execution of Essex: her last days were consumed in a strange despair over the fate of her late favourite, and in the end she seemed alone and fearful. Here is Robert Carey’s story: a first hand account, and probably the most cited amongst historians. Carey (or Carew – from a famous West Country family) was the grandson of Elizabeth’s aunt, Mary Boleyn. In 1587 the queen sent him to Scotland to assure James VI that the execution of the king’s mother, Mary Queen of Scots, had not been by her choice. In return Carey enjoyed various offices in the government of the troublesome Scottish borders. Fifteen years later, when Elizabeth lay dying, Carey was alerted – probably by his sister, Lady Scrope (or Scroop – see below) – and he rushed to London in the hope of being the first to convey the news of the queen’s death to the Scots king (an episode involving a famous ring). This political engagement is important in assessing the reliability of Carey’s story. The reference to “the end of the year 1602” is based on the Julian calendar, in which the last day of the year fell on 24 March. I took my journey about the end of the year 1602. When I came to court, I found the Queen ill disposed, and she kept her inner lodging; yet she, hearing of my arrival, sent for me. I found her in one of her withdrawing chambers, sitting low upon her cushions. She called me to her; I kissed her hand, and told her it was my chiefest happiness to see her in safety, and in health, which I wished might long continue. She took me by the hand, and wrung it hard, and said, ‘No, Robin, I am not well,’ and then discoursed with me of her indisposition, and that her heart had been sad and heavy for ten or twelve days; and in her discourse, she fetched not so few as forty or fifty great sighs. I was grieved at the first to see her in this plight; for in all my lifetime before, I never knew her fetch a sigh, but when the Queen of Scots was beheaded. Then, upon my knowledge, she shed many tears and sighs, manifesting her innocence, that she never gave consent to the death of that Queen. I used the best words I could, to persuade her from this melancholy humour; but I found by her it was too deep-rooted in her heart, and hardly to be removed. This was upon a Saturday night, and she gave command, that the great closet should be prepared for her to go to chapel the next morning. The next day, all things being in readiness, we long expected her coming. After eleven o’clock, one of the grooms came out, and bade make ready for the private closet; she would not go to the great. There we stayed long for her coming, but at the last she had cushions laid for her in the privy chamber hard by the closet door, and there she heard service. From that day forwards, she grew worse and worse. She remained upon her cushions four days and nights at the least. All about her could not persuade her, either to take any sustenance, or go to bed. The Queen grew worse and worse, because she would be so, none about her being able to persuade her to go to bed. My Lord Admiral was sent for, (who, by reason of my sister’s death, that was his wife, had absented himself some fortnight from court;) what by fair means, what by force, he got her to bed. There was no hope of her recovery, because she refused all remedies. On Wednesday, the 23d of March, she grew speechless. That afternoon, by signs, she called for her council, and by putting her hand to her head, when the king of Scots was named to succeed her, they all knew he was the man she desired should reign after her. About six at night she made signs for Archbishop Whitgift and her chaplains to come to her, at which time I went in with them, and sat upon my knees full of tears to see that heavy sight. Her Majesty lay upon her back, with one hand in the bed, and the other without. The bishop kneeled down by her, and examined her first of her faith; and she so punctually answered all his several questions, by lifting up her eyes, and holding up her hand, as it was a comfort to all the beholders. Then the good man told her plainly what she was, and what she was to come to; and though she had been long a great Queen here upon earth, yet shortly she was to yield an account of her stewardship to the King of kings. After this he began to pray, and all that were by did answer him. After he had continued long in prayer, till the old man’s knees were weary, he blessed her, and meant to rise and leave her. The Queen made a sign with her hand. My sister Scroop knowing her meaning, told the bishop the Queen desired he would pray still. He did so for a long half hour more, with earnest cries to God for her soul’s health, which he uttered with that fervency of spirit, as the Queen, to all our sight, much rejoiced thereat, and gave testimony to us all of her Christian and comfortable end. By this time it grew late, and every one departed, all but her women that attended her. This that I heard with my ears, and did see with my eyes, I thought it my duty to set down, and to affirm it for a truth, upon the faith of a Christian; because I know there have been many false lies reported of the end and death of that good lady.